Willie and June extend a very warm welcome to Hawthorn Bed & Breakfast and our three Self Catering Holiday Cottages, which are situated on 20 acres of croft land in Benderloch, near Oban. We are less than a mile from the village of Benderloch with a well stocked general store and post office, garage, coffee shop and small church. Just a few minutes walk from us is the beautiful sandy Tralee Bay beach, perfect for families to enjoy. 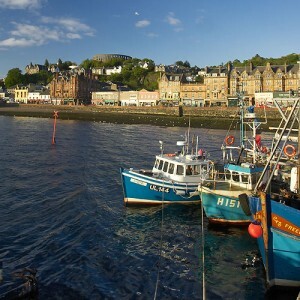 Oban, known as ‘the Gateway to the Isles” is only an 8 mile drive where all the ferries depart to the various islands,with Mull and Iona being the favourites and for the more adventurous Fingal’s Cave on Staffa. Other islands close at hand to explore are Lismore, Kererra and the Slate Islands of Luing, Seil and Easdale. The bed and breakfast and cottages are also the perfect base for exploring the scenic mainland, whether heading north to Glencoe and Fort William or south towards Kilmartin to see the standing stones and museum. Whichever direction you head in you will find plenty of opportunities for walking, bird watching, fishing, photography or just relaxing. With our range of self catering accommodation and the Bed & Breakfast we are the perfect base for a holiday with extended family or friends. There are plenty of activities and sites in the area to amuse all ages, so why not make this the base for a family celebration. And with our restaurant next door you can round the week off with a meal with loved ones. A truly idyllic and peaceful situation where relaxation is our main aim.